The below guide covers; Hair Accessories, Hair Products, Nail Products, Fragrance, Makeup and Male Grooming Products. The below is a mandatory requirement and must be carried out by the vendor. Any deviations from the below can result in a chargeback. All products should be labelled with the small Price Sticker positioned on the base / reverse of the item. The Price Sticker MUST NOT cover any safety warnings. All items must then be individually Bubble Wrapped and then placed into a Poly-Bag. 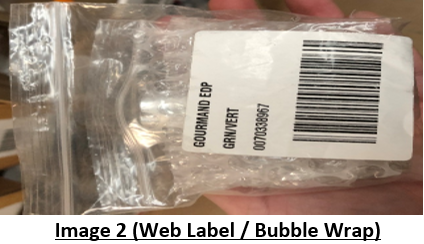 The large Web Label must then be placed on the outside of the bag. Please note that all products must pass URBN’s drop test requirements and any Poly-Bags with an opening greater than 5” needs to have a suffocation warning present. All URBAN OUTFITTERS tester products do not require retail Price Stickers. 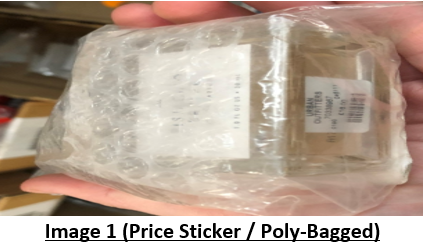 Instead all units are to be labelled with “Try Me” stickers (Vendors will receive the PDF version of these stickers from buying operations once POs are issued). Vendor’s need to produce “Try Me” stickers on their own – Checknet / Fineline do not provide these. All ANTHROPOLOGIE tester products do not require labelling – these are labelled by the stores. Please remember all units should be packaged in an outer carton with a Tradestone carton label on the outside, and with the packing list on the first carton. All digital cartons must be sealed with red tape and all retail cartons must be sealed with clear tape.